I have been playing a bit with sewing. Just bits of time here and there. 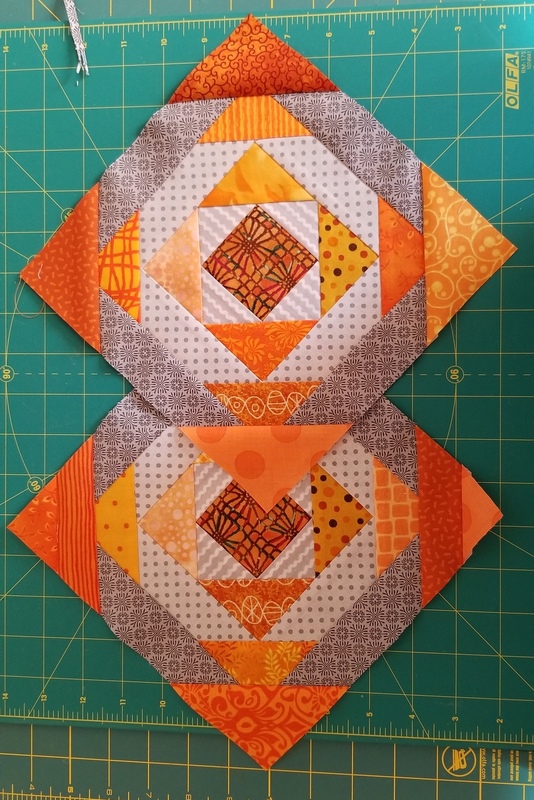 I made the pineapple blocks above using scraps left from making the pumpkin placemats below. I had fun making these because I could finish them. I have been experimenting with a couple other things but cannot settle to one that I want to do. I seem to have slowed down a lot...takes me so long to get anything accomplished. These are totally stunning! I just love them. You could sell them for a lot of money!! Yes, we usually have a lot of doctor appointments every month. The pumpkin placemats are adorable! I really like the gray with the orange on your pineapple blocks. A[[ts can be so tiring for all----hope so many are behind you now. I love your sewing projects. The fabrics are lovely and your work is so perfect. With the time changing, it will be fun for you to sew on these long evenings. You have the greatest pieces of creativity! I love the pumpkin placemats so much!! I love your pumpkin placemats, very pretty. Glad you had a nice trip with your daughter! ...I seem to have a long list of uncompleted tasks! perfect pumpkins and I love them. just right to spruce up the table for this time of year... you have a lot on your plate and I am sure that is the reason for the slow down. my slow down surround HOUSE work. LOL... other things I can do. I love those placemats. They are so cheerful! I know what you mean about getting things done. We usually have a calendar full of appointments. This past week we were clear and I finally got Laurie's quilt stitching DONE, but only have to bind it. Glad you were able to get away for a long weekend AND visit your daughter. Oh they are lovely, so nice and colorful. Glad you got away to visit your daughter! I love your beautiful makes, Rose. The potholders and the pumpkins are gorgeous. You're really channelling the glorious colours of autumn, and, of course, it takes time when you're being so meticulous. These are beautiful and bright. I'm sure you will think of something to turn them into. Hi Rose, your pumpkin placemats are a Wow! Beautiful. You could definitely sell those. Glad you got to see your daughter for a nice visit. Have a nice weekend! Pretty autumn colors ... beautiful work! These placemats are gorgeous! Love the colors. I need to make a little mug rug with Fall colors! Enjoy your week! Hugs! I really need to visit St Louis again. It has been a long time and I really didn't get to see enough of the city. Have a great week.